Note from Jennifer: The following article is part one of two on the subject of why giving feels good by Greg Evans, PhD. I was connected to Greg through The Smile Epidemic and am elated that he wrote this article for another jennifer. Because of the length, I decided to divide his post into two. Greg is a positive psychologist and happiness expert. How cool is that? I think you will find his insights and research fascinating. You can read the second article here. Selfish behavior by its very definition is aimed at bringing ourselves more happiness, yet study after study finds that unselfish more so than selfish people report feeling happy and satisfied with life. The scientifically demonstrated benefit of a kind disposition is uplifting news. Also, knowing that he is probably miserable makes me feel better about my neighbour who still has not returned my leaf blower. There is undoubtedly some truth to this; often we need to be happy before we can be help someone else to be happy. The sociologist Nicholas Christakis from Harvard University has shown that happiness is in fact a social contagion. Happy people have measurable benefits on the well-being of their friends and even strangers within their social networks. As it turns out, happiness is not so different from the flu. This common sense “oxygen mask” advice might be hiding a larger truth. Research conducted by Diana M. Tice and Roy F. Baumeister demonstrated that one of the best known mood enhancers was not focusing on ourselves, rather it was doing something kind for someone else—even when we are not feeling our best. Perhaps especially when we are not feeling our best? In other words, putting the preverbal mask on someone else first may ironically be the most effective way for us to breathe. The paradox is that being selfish in the traditional sense of the word (self-absorbed), is not being selfish in terms of obtaining the most happiness. Based on the collective scientific findings, one might convince even the most self-centred person to help others on the basis that it is what is best for their own happiness. I am hoping my neighbor is reading this. But why does giving make us feel good? A common misinterpretation of Darwin’s survival of the fit is that all creatures big and small are meant only to compete with one another. But there are many examples in nature of the benefits of giving. Often the best way to look out for ourselves is by giving to others—it’s not exactly pure altruism, but a sort of enlightened selfishness. 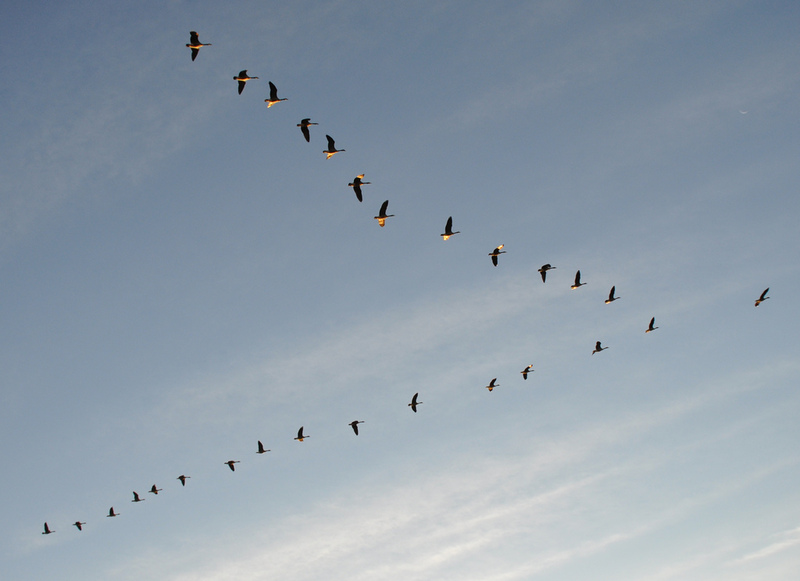 Canadian geese fly south in the form of a V shape, with each of the strongest flyers taking turns at the front where there is the most air resistance. More remarkably, if any bird drops behind the group, two other birds typically do so as well, encouraging the fallen bird to rejoin the group at what seems to be great risk to their own personal survival. The chance of individual survival actually increases when taking into account that the other birds would also be willing to help if they were to fall behind. Vampire bats, Haidt points out, would share on a successful night of blood sucking with generically unrelated peers. This might also seem to go against the idea of Darwinian competition, except that the bats remember who shared with them, and they in turned shared with these bats. In the most amusing study, researchers sent out Christmas cards to random strangers and to their surprise the majority of people sent Christmas cards in return. It appears humans have an internally motivated need to return a favor, even to a stranger. This reminds me, I have 35 years of Christmas cards to respond to. But hold on a minute, so does this mean that we just give everything away and we get more in return? As you might guess the creation of a hyper-social world is more complicated than simply being kind to everyone and handing over all our time and belongings. Tune in next week for part two of this post! I am SO glad you introduced us to Greg Evans, Jennifer! Can’t wait for part 2! He’s great, isn’t he? I love hearing the psychology behind giving. This is such a great discussion and I can’t wait for it to be continued. I know for me, I need to put that oxygen mask on first for me to be useful to anyone, yet once it’s on, I am pretty much able to give as much as needed to those around me and enjoy doing so. Can’t wait for part 2! The whole oxygen mask discussion has me thinking about my own experiences. I need to pay attention to when giving makes me feel the best (i.e, when I’m in a good or bad mood). I’m not sure I’ve paid attention to that! I love this. It totally makes sense and intuitively it feels right…at least from my own experiences. I love that is seems we are programmed to return a favor. That gives me hope for all of us!! It’s cool to learn about the psychology of giving, isn’t it? I love that we are wired for it. It does give us some hope! Love this post! So many interesting tidbits on the way we’re wired. Looking forward to part 2. It really is interesting! I love learning about this stuff. The field of positive psychology is pretty new. I wish I knew about it when I was studying psych in college! Also true. So cool the different paths you can take! I noticed when most people think of Psychology they think of crazy people, psychopaths/criminals, and psychotherapy/counseling. Greg is a new breed of psychologists that focuses research on what makes people feel satisfied with their personal and professional lives. I can’t wait for more research to develop from people like Greg! Exactly! I’ve worked in social services for some time here in Maine (in communications), so I know a lot of social workers and psychologists. It’s amazing how negative the whole concept of counseling is. Our wellbeing is so much more than crazy vs. not crazy. Are you familiar with Hannah Curtis’s blog, New Approaches (http://newapproachesme.com/blog)? She was in the Skillshare class. Her goal is to re-define how we think about therapy. I don’t remember coming across her blog because there were so many to read. Love this post! How true it is that giving back often brings us great joy! Love the parallel with the geese and never would have guessed that with Christmas cards! The Christmas card study is hilarious. But it’s so true. I always feel compelled to send a card back if I receive a card from someone that wasn’t on my list!